A few weeks ago I saw a pair of shoes that I really liked. It was a pair of wedges with a peep-toe, closed back, and a deep burgundy red. I really wanted to get it, and did I mention it was on sale? Unfortunately they didn't have my size, typical! Then I remembered I had very similar pair of wedges at home, but in grey. So what's a girl to do? Dye it the colour that she wants! I used Waproo leather dye in Cherry Red which I bought from a shoe repair store for less than $10 and I love how it turned out. Masking tape (optional) - to mask the parts of the shoe that you do not want to dye. Clean your shoes - if your shoes are real leather then use some leather stripper on a cotton wool to clean it and prepare for dying. If your shoes are faux leather do not use a leather stripper on it (it'll melt the material! ), just use a damp cloth to give it a good clean. (Optional) - mask any part of the shoe that you do not want to dye, e.g. the heel. Dye your shoes! - the Waproo shoe dye comes with it's own brush under the lid, kind of like a large nail polish brush. Apply 2 coats of the dye, letting it dry a few hours between coats. Clean up any mess and leave your newly dyed shoes overnight to dry before wearing it. There, it's as easy as that! Notes: My shoes were faux leather so I did not use the leather stripper. I also did not bother with masking tape as I have a fairly steady hand, so I was careful not to apply paint on areas I didn't want to. So, what do you think of this little DIY? 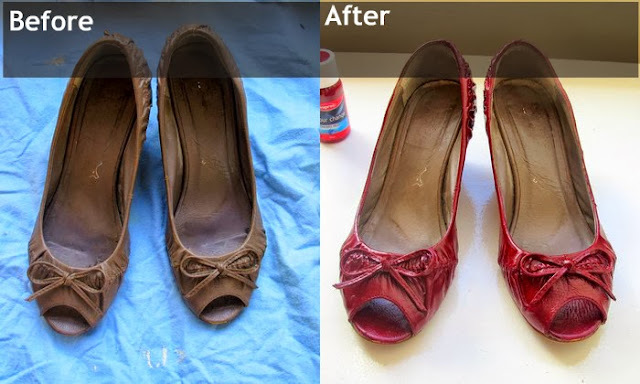 Have you ever dyed your shoes? Would you? That is really cool. I wonder if those paints will fix/hide scratches.